Something's Amist is a Duel minigame found in Mario Party 6. Its name comes from the phase "something's amiss". The objective of this minigame is to get three gemstones first. 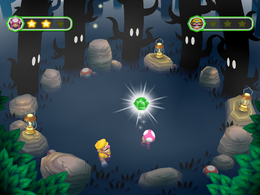 When the player's controller rumbles, the player should press quickly to pull a gemstone out of the ground. The trees in the background will be looking at the area in which the gemstone is buried, however the player must walk directly above the exact location of the gem or they will not detect it. Every time a gemstone is retrieved, the trees shuffle slightly, not giving immediate direction to the next one. If the rumble feature is turned off, an exclamation mark appears instead. There is a page in the Miracle Book that features a scenario based on this minigame. Rules – "Hunt for gemstones hidden in the fog. When your Controller rumbles, a gemstone is nearby! Find three gemstones first to win!" Advice 1 – "Frantically search through the fog for precious gemstones. Watch the eyes on the trees for a hint on where to find the gemstone." Advice 2 – "If you have the Rumble Feature disabled, an "!" will appear instead." This page was last edited on February 15, 2018, at 14:57.